Although I've known about it all summer, felt it's presence looming on the horizon for a long time, it still managed to sneak up on me anyway. The day my precious child leaves home for a significant portion of the day, wearing a backpack and clutching a lunch. For the past several days we've been getting ready with the physical stuff, the uniforms, the lunch box, the new shoes. Errands here and there taking up time, precious time. She's been asking lots of questions and we've been talking more about what to expect in Kindergarten. In her own way she is sharing her fears and uncertainties, seeking my reassurance. She was thrilled to receive a postcard from her teacher earlier this week, I was thrilled to read in the parent letter that her teacher is praying for Annelise and the entire class. My heart was comforted. 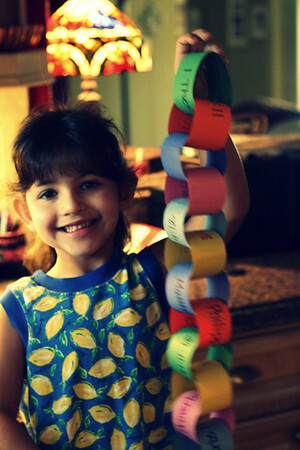 In an effort to create even more enthusiasm (if that's possible) Annelise and I made a paper chain to count down the days until Kindergarten blast-off. 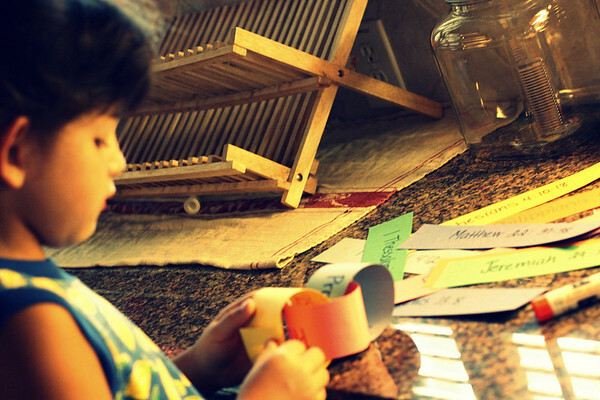 In an effort to increase our time in God's word I wrote a scripture on each strip of paper. Scriptures that I hope will ease any anxiety she (we) might be having and remind her (us) that God's word is most important. Needless to say she LOVED gluing the strips together, taking time to choose the next color ever so carefully. Bless her little picky heart. She also seems to be excited about tearing off a new link each day AND looking the scripture up in the Bible together. Bless her little enthusiastic heart. Bless her heart. Please, Lord. I love that idea and she is just precious! When Griffin stepped on that bus his 1st day of kinder last year, that's when I knew I would do whatever it takes to try for a 3rd baby! Here I am a year later still trying. . . it is just so sad to me when they "leave" to start big school! *sniff* Such a happy time but also filled with so many other emotions. I love the circle chain - beautiful colors perfectly coordinated! Our neighborhood bus stop is at the corner where we live and Monday was the first day of school and I was right there at the window watching all the kids get on the bus....many for the very first time as kindergartners! You all will do great, I am sure. Can't wait to read all about her first day of school, and all the days to come. totally sweet. i imagine you will both find new blessings as the school year begins. Just a note to myself so I don't forget: Annelise decided to keep the torn loops in her lock box because she thought they were important to keep in a safe place. Awww...that makes Mama feel good!